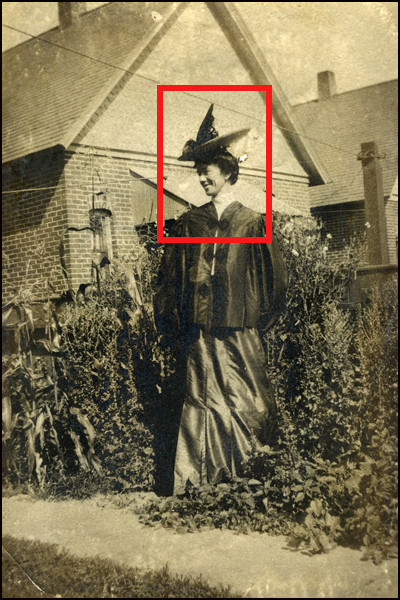 As mentioned a bit earlier in a previous blog posting, it is often possible to quickly and easily date the images and media one comes across in a family archive—you just need to know where to look. Note the hand-written date in the purple box. THIS is why I’m keeping prints and negs in the same original envelopes until the time comes to transfer them—and this important identification info—into archival print and negative envelopes, archival print pages, or archival albums. When such date references are not found, dating photos is still possible by asking those who are in them what’s what. For example: “Hey, Grandma, I found these pix of you and some guy (who, unfortunately, isn’t Grandpa) out at some beach somewhere. Got any idea where / when?” If Grandma’s not around cuz she “stepped out”—if you get my drift—then you can ask mom or dad, as they might know through their knowledge of family history. Grandma has apparently stepped out for a moment. If that’s not possible because mom was abducted by space aliens years ago and dad’s out bowling then you can always come up with a date range by looking at the style of cars or dress or hairdos or hats that are in your photographs. Maybe that senior citizen down at the hair salon can be of help if you don’t have a sense of historic styles, and of course there is always the Internet. Just type in “hat styles of the 1930s, or 1940s,” or whatever year you can guess and then compare what you have to what was popular at the time. If all else fails, you can write “c.1940,” which is the abbreviation for “circa 1940,” which is fancy art history speak for “around 1940.” Voilà, you’re an art historian. Your diploma is in the mail. But seriously folks, the following are some easy dating references commonly found on photographs and other media, and more information can be found at the Image Permanence Institute’s Graphics Atlas website, perhaps the most comprehensive resource out there for identifying and dating photos, by clicking here. 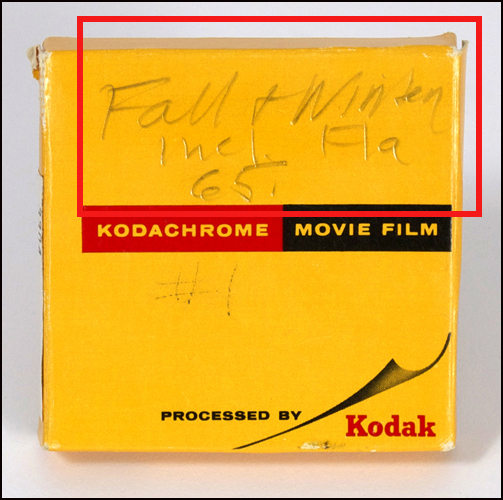 Note the dates, subjects and locations indicated on various elements of this particular box of 35mm color slides. Also notice that there is no chicken wing sauce on any of these irreplaceable artifacts (see Blog #3). Now, I like my chicken wings, but…. This is another example of why it is recommended that original boxes and envelopes be kept, as they often offer a wealth of information. 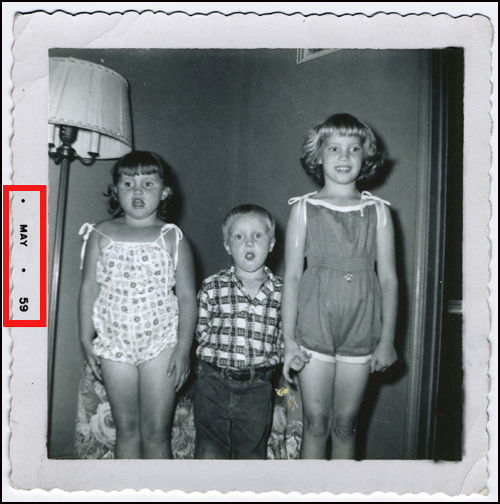 Not only did my maternal grandparents write the subject (images of their home at 2211 Grandin Road / Xmas / snow in the yard / the sitting room) and the date (1963) on this box of slides, they also wrote “2211 Grandin” on one of the slides (the Grandin Road house was in Cincinnati, Ohio). 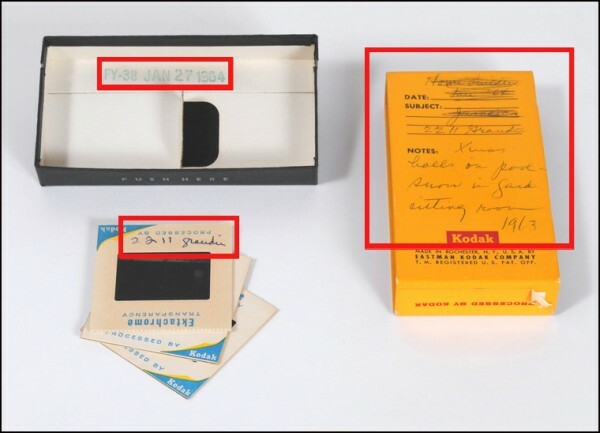 Lastly, the interior of the box, underneath the 24 slides, was imprinted with the date of processing – January 27, 1964. All of this information will be transferred to archival enclosures that will safely protect these slides from moisture, dust, fingerprints and other hazards to their long-term survival. Now, I’m no rocket surgeon, but even I can probably figure out what’s in the box with THIS label attached to it. 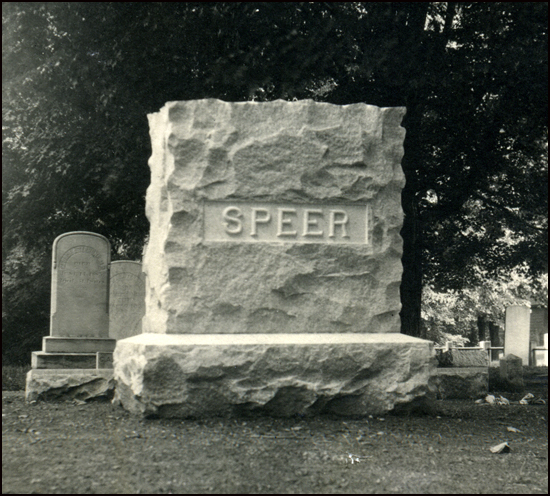 Fortunately, my paternal grandfather was not only a prolific amateur snapshot photographer he was also a stickler for organization, at least when it came to his snapshots. 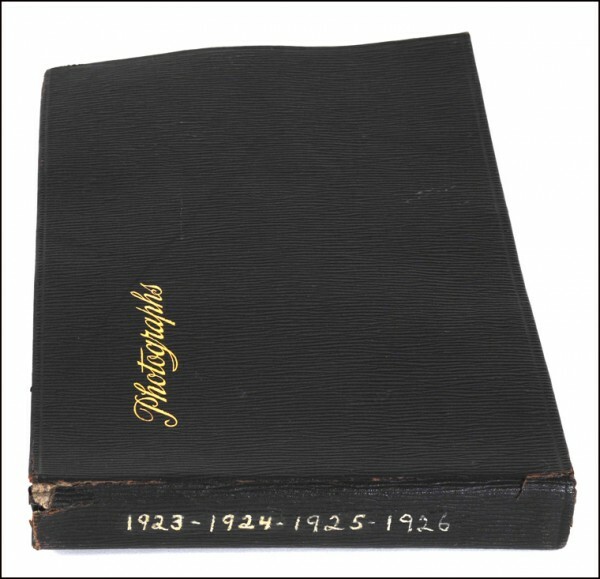 I have inherited over a dozen photo albums just like this, and it gets even better as all the photographs inside are each captioned by hand in white ink. Who’s who, what’s what, and when’s when are all painstakingly recorded within these covers, which allows them to be used for other aspects related to tracking down my family’s history and dating photos. When not provided with this level of accurate dating within the context of an album, one can often look to individual photographs themselves. May, 1959. Boom! Concise. To the point. May…. May what??? Not helpful. Why bother? 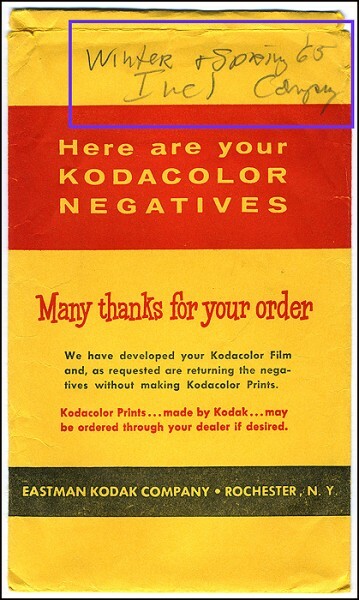 Note the date—August 1966—printed on this film’s leader. 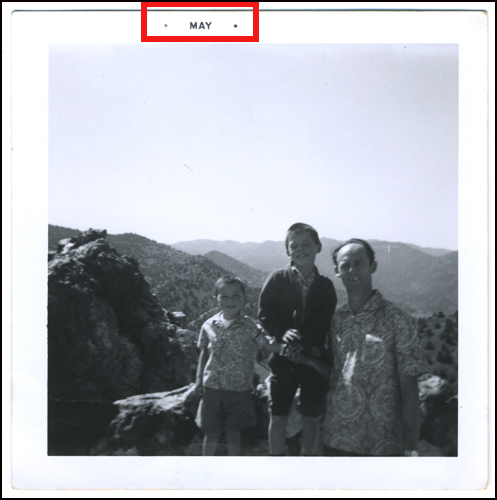 Another helpful service provided by a photo processor, in this case the printed date on an 8mm home movie. 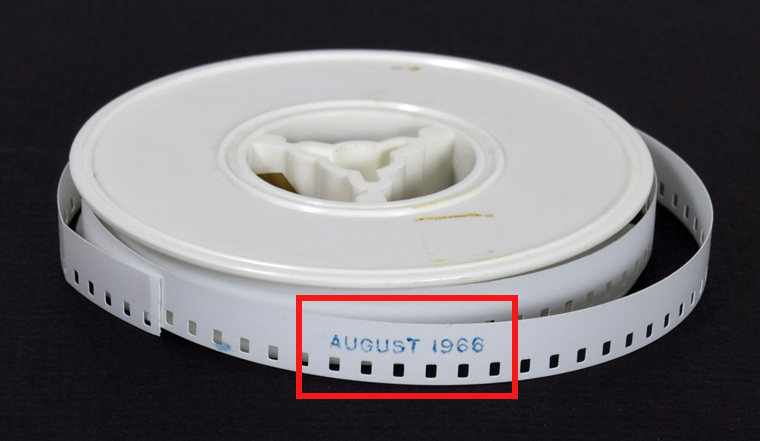 Again, this date indicates when the reel was processed rather than when it was actually shot, but one can usually assume that this film was probably exposed within a year or two of this date. “Fall & Winter, including Florida, 1965” I remember this trip my parents went on. I was seven years old, and didn’t understand the concept of a “vacation.” I thought they were maybe gone forever. I cried and cried, and wanted them to come back as soon as possible. Ten years later, when I was 17, I wanted them to go on vacation as often as possible, and for as long as possible. C’mon, admit it. We ALL wanted that when we were 17!!! Dates + places = invaluable info. Keep the freakin’ boxes!!! Boxes containing my dad’s home movies again serve to help identify the time and place of these invaluable family records, information that will follow these films as they are converted into digital files and then copied onto DVDs for me to share with the rest of my family. These films haven’t been seen in almost 50 years, but now that they have been found (and identified) all that is about to change. 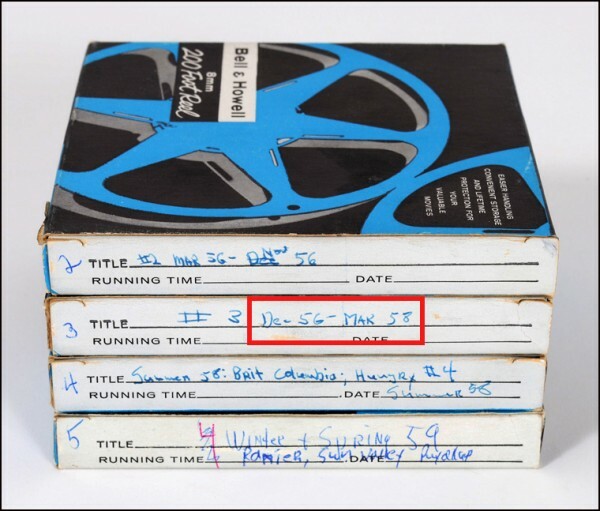 This brings up another great aspect of this archiving project, as these artifacts will not just be safely stored for posterity, they will be brought back to life for current generations to enjoy (i.e. laugh at how dopey I was as a kid—still am, depending on who ya ask). on photographic storage and presentation, c.1995. This is a classic case of misidentification. The daguerreotype process was announced in 1839, and while telegraph poles showed up in ever greater numbers starting in the 1840s, telephone poles didn’t arrive until after Alexander Graham Bell’s (and others) announcement in the mid-1870s. “rare” photographic artifact currently resides. This type of hat is comin’ back, folks. Seriously. Just look at the Paris runway shows. Fashion is cyclical. So, go out and buy a hat like this today. You’ll be the talk of the town, THAT’S for sure. Likewise this monstrosity…er…fashionable couture. In all honesty, the hats from the Art Deco era had it all goin’ on. Maybe not this particular hat, but you get my point. These are two examples of hats as potential aids to dating photos that are otherwise unmarked. 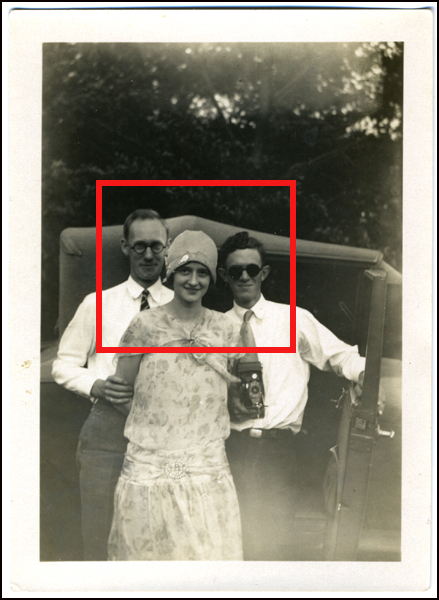 The woman in the top image wears a hat that dates this image to c.1905, while the flapper-style hat worn by the woman below it dates this image to c.1925-1930. Likewise, the automobile model behind the trio also points to this approximate date. 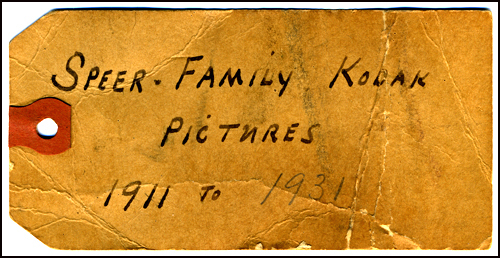 Lastly, while none of these individuals are identified either on the image or on the back—where people often wrote the names of those in the photograph—if one looks through his or her family archive very carefully one can often find additional photographs of the same people who might in that instance be identified. Once obtained, such dating and potential identification can now accompany these images as they are placed in the appropriate archival album pages, sleeves, boxes and frames. So, now I’m really ready to jump into the intricate identification, dating and, most importantly, the CORRECT archival presentation and storage options that each different media type needs and demands. Its taken five blogs to get here, but all is well, as “setting the stage” is gigantically important as everything else falls into place so much more easily when one gets his or her act together (I’m still workin’ on that, folks, but I’m gettin’ there). Now its on to the “meat and potatoes” of the effort, as they used to say back in the day (with apologies to my vegetarian / vegan / frutarian friends). Got a question thus far? Got a particularly challenging archival / preservation / presentation / organizational / storage nut that just won’t crack? Don’t know what’s what re: your personal archive or collection? Post a comment or contact us, we’ll get ya through it!